Vancouver B.C. 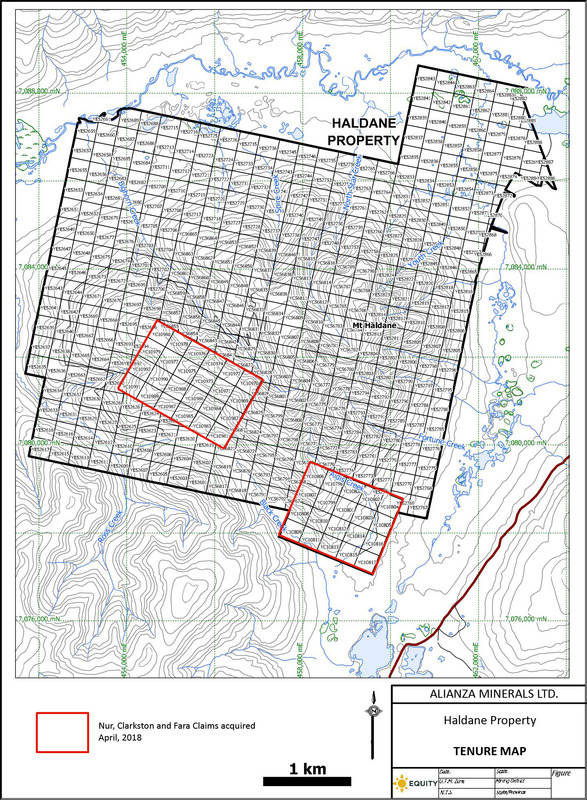 – April 16, 2018 – Alianza Minerals Ltd. (TSXV:ANZ) (“Alianza” or the “Company”) is pleased to report that it has acquired additional claims contiguous to the Haldane Property in the historic Keno Hill Silver District, YT. Forty-four claims were purchased from the estate of Yukon prospector John Peter Ross, bringing the total area of the Company’s property position to 8,579 hectares. 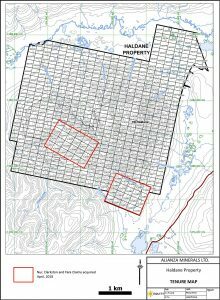 The 8,579 hectare Haldane Property is located 25 km west of Keno City, YT in the western portion of the Keno Hill Silver District. Mineralization in the district consists of structurally-controlled, silver-bearing veins. Silver production began in the Keno district in 1913, with over 200 million ounces of silver produced through 1989. Production statistics from the Yukon government Minfile (2003) state that 4.87 million tonnes were mined at an average grade of 1,389 g/t silver, 5.62% lead and 3.14% zinc in that time. Alianza’s preliminary plans for the 2018 field season at Haldane include additional prospecting and soil sampling to identify new vein structures and strike extension of known structures. This may be augmented by magnetic and Very Low Frequency (VLF) electromagnetic geophysical surveys, soil geochemical surveys and trenching. Equity Exploration Consultants Ltd. will undertake the 2018 program on Alianza’s behalf. 500,000 shares to be issued upon the decision to commence construction of a mine or processing plant. The Company has 37.4 million shares issued and outstanding and is listed on the TSX Venture Exchange (TSX-V: ANZ). Mr. Murray Jones, MSc, P.Geo., of Equity Exploration Consultants Ltd. is a Qualified Person as defined by National Instrument 43-101. Mr. Jones supervised the preparation of the technical information contained in this release.